Works are scheduled to commence imminently on the phase 2 leisure development proposed for the Rushden Lakes masterplan in the Nene Valley, East Northamptonshire, following sign off by the Secretary for State. Designed by The Harris Partnership with developer LXB Properties for The Crown Estate, Phase 2 (leisure building and Terrace D) includes a 14 screen cinema and restaurants alongside 380,000 sq.ft of phase 1 retail units anchored by M&S, House of Fraser and Primark which opened this summer. The £140 million masterplan occupies 30 acres of a 244 acre site on the edge of the A45, establishing a truly unique retail and leisure destination whilst simultaneously restoring access to the network of Rushden Lakes and opening up some of Northamptonshire’s most stunning countryside to public use. The Harris Partnership were initially brought in to evolve the design for the Leisure Building and Terrace D, to maintain its sensitive integration within the local context and establish a sense of place within Rushden. 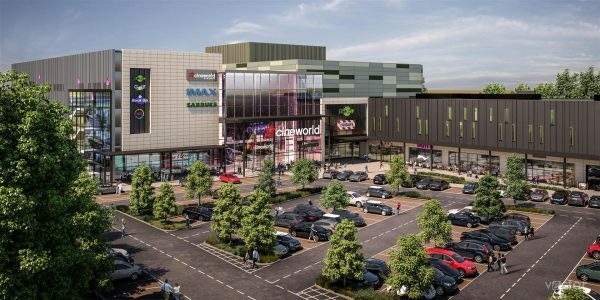 The firm has since increased its involvement in the various future phases to include the Garden Square and Link Road masterplan proposals for the Rushden Lakes site.